NuProg-F8A is the new generation UFS/eMMC gang duplicator. Support UFS v2.1 and eMMC v5.1 storage IC. All new design architecture makes the machine into the compact size. 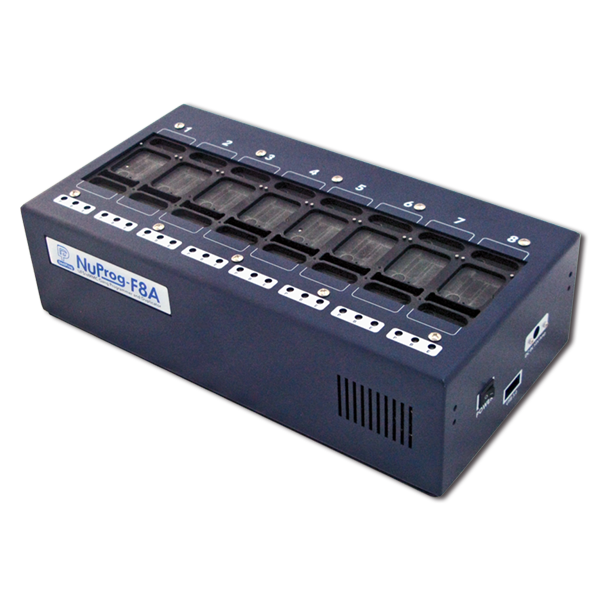 NuProg-F8A supports multiple machines in one PC. User can duplicate the IC from NuProg-E to several NuProg-F8A for small volume production demand. Data Transfer Speed is at 180MB/s max. The real read/write speed depends on various factors such as communication protocol, chip controller performance, and NAND technology, etc. NuProg-F8A requires socket adaptor to program IC, every socket adaptor corresponds to different IC kind, package type, and size, please choose the appropriate socket adaptor from the list below. If you have any questions, please contact Dediprog sales (sales@dediprog.com). 1. Fix dwcmd -d download project fail while multiple StarProg-A/K100/K110. 2. Fix Block index issue on load file for NAND. 3. Fix command line issue while use over 10 StarProg-ATE. 4. Fix the issue that batch setting is able to set Program and Verify after load the project with erase only. 5. Fix the Buffer checksum issue after select IC part number. 6. Fix the Log shows USB communication fail while press Buffer > Option/Config. 7. Fix the Programmer index issue while pressing socket counter. 8. Fix Load Prj issue if the project is recreated through LoadPrj. 10. Remove blank RPMB for NuProg-E.
11. Fix the dialog of Load for NAND. 12. Fix the program result issue for NuProg. 13. 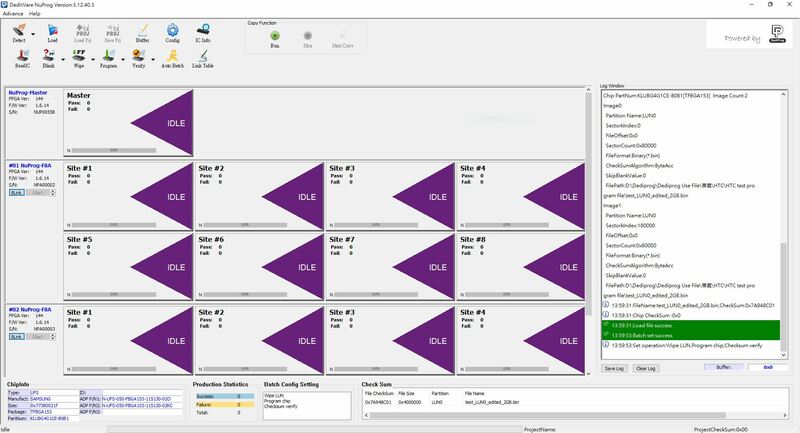 Fix the programmer order method while NuProg and ProgMaster are used on the same computer. 14. Fix NuProg download vector option issue. 15. Set limit to 50 words on SavePrj option. 17. Fix detect UFS issue for NuProg. 18. Fix icon level issue. 19. Fix start time of project report through Dediware command. 20. Fix project with password issue through Dediware command. 21. Fix project with serial number through Dediware command. 22. Fix low density project issue on Dediware. 23. Fix checksum issue for ATTINY1617. 24. Fix Dediware StarProg/ProgMaster login fail issue after computer reboot, and optimize Dediware connection.